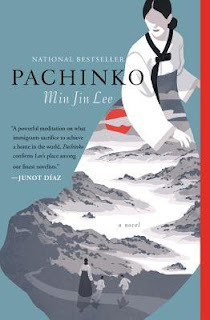 Spanning most of the 20th century, Pachinko is the story of a Korean family in Japan. It begins with Sunja, a teenaged girl in Korea who attracts the attention of an older man. When she becomes pregnant, he says he's already married but offers to keep her as a mistress. She refuses, Her situation feels hopeless, but a kind man offers to marry her and they go to Japan together. There the family stays, never quite fitting in but not feeling like they can return to Korea either. Starting a new life in a new country is hard. Sunja and her new husband stay with his brother and his wife, but they are all poor. Gradually they became settled and the family did better. Sunja couldn't read, which was not unusual for women at that time, but it made things even more difficult for her. She and her sister-in-law bought a cart to sell kimchee on the street, slowly building up their small business. Her sons were more educated and successful than she was - one went to college and the other went into the pachinko business. The family's status as foreigners was one of the main themes of the novel. Sunja's children and grandchildren were born and raised in Japan, yet were never quite accepted. This shaped their lives in very significant ways. Being Korean cut off certain opportunities for work and relationships. One character passed as Japanese, but it meant cutting off from family and keeping this huge secret. Sunja often said that it's a woman's lot to suffer, but everyone suffers in this story. There's a lot more to it than I've gone into - more characters, more death, yakuza, the return of the man who got Sunja pregnant. It's a lot! It was sad, but not depressing. Although there was tragedy and hardship, the family kept going and over the years they really did make their lives better and easier in a lot of ways. This was just the sort of immersive experience I love in a historical novel. It sucked me in from the start and I spent many happy hours reading about all these lives and experiences that all felt so real to me. This is on my 2019 TBR Pile Challenge, and it's my fifth completed book out of twelve.